Neeta Pedersen’s distinctive vision comes from her unusual heritage, her extensive travels and her rich visual imagination. She has succeeded in developing a very strong graphic style all of her own and has created a substantial body of original work – paintings, graphics, illustrations, animations and sculptures – full of sensuality and emotion. She also produces silk scarves, mugs, cushions and canvas bags with her designs. 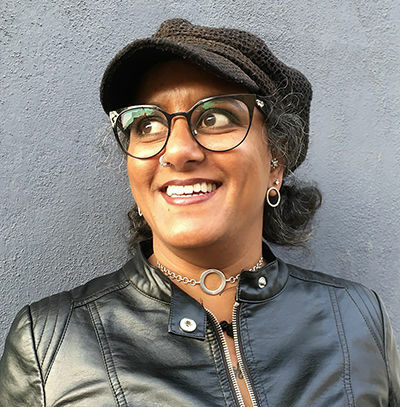 Danish/British/ Indian artist Neeta Pedersen’s distinctive vision comes from her unusual heritage, her extensive travels and her rich visual imagination. She has succeeded in developing a very strong style of her own and has created a substantial body of original work. She works in many media including paintings, sculptures, digital art, design, illustration and animation. Her unique style has gained her an international reputation. Her work has been shown in leading galleries in Denmark and the UK including London’s Cork Street and is held in private collections in Denmark, Norway, Sweden, France, Canada, USA and England. Neeta’s remarkable real-life experiences have had a big effect on her artistic career. Born in Mumbai and adopted by a Danish couple at the age of six months, Neeta grew up in Aarhus and began drawing at an early age. Leaving home at 17, she worked on an Israeli kibbutz and subsequently travelled to India and Nepal for six months to absorb and observe the culture she came from. Her extensive travelling has also taken her to France, Germany, Central Europe, Scandinavia as well as Boston and New York in the US. In 1997, she moved to Lewes and studied at Brighton College of Technology, where she gained a BTEC National Diploma in Multimedia. In 1999, she enrolled in the Total Immersion Intensive Workshop at the New York Film Academy and, in 2005, gained a BA (Hons) in Animation from the University of Westminster in London. Her graduation film ‘Disharmonious Coincidence’ was subsequently screened at film festivals in London, Italy, Japan, France and Romania and was selected by British Council Film to be included in their British Films Directory.